A long time ago, once upon a time even, I was a small child who had grown up with technology at his fingertips in the way that our parents grew up with libraries and books. I grew up alongside technology and I never once, not until I had grown much older, even questioned if it was something other people used as frequently as I did. I saw people reading books, playing sports, making art, and watching film. It had to be the same with technology, computers, and video games… right? The relative history of my parents and their siblings showed me that it really was that new. Books older than the existence of our country. Sports with team histories that broke barriers. Art in museums filled with the bones of things that no longer walked this earth. But why did I know the same as the adults? Shouldn’t they have learned to use these better than I can as they grew up? They were learning with me and I didn’t even know it. They could solve harder math problems than me, run faster, but they still could only operate a computer at the same level as me. We were on equal ground. My mother went into programming during my time in elementary school and would be up late hours writing code and spend that time with me teaching me little fragments of code and how to find and debug errors in her programs. Suddenly I’m in a world where I can do more with a computer if I learn how to. I could tinker with the software, because unlike taking apart a radio and then putting it back together, there was nothing physical for me to break. I found my own shortcuts and key commands to make my time on the computer more efficient. I looked at everything as if it had existed in ancient tomes and had people out there with encyclopedic knowledge of what to do. If something new came on the market, I wouldn’t even consider it as something groundbreaking. Just the newest car model improving on what had been there before. When YouTube launched in 2005, I treated it as if it were as in the public eye as significant as the bible. Everyone knew about it but I didn’t know it existed until now, so surely someone can help me navigate. What I didn’t know was that I used something daily that only a few months prior only the team of developers and testers had experience with. I had to learn on my own, no one to help me. When Google acquired YouTube in late 2006, I felt as though the platform itself had a long history of its own, and looking back now I can see how the styles of videos have changed and improved as film making and editing have become more common for the layperson to use. Bringing us up to speed to the present day I feel as though I have a synergistic relationship with technology. I use technology on a daily basis, for almost every aspect of my life I can think of. Except showers. Well, waterproof speakers actually so that’s out. Computers help me with various projects, or my projects are directly based through digital media such as the Theatre Department’s Twitter Improv Troupe Where’s Willie? in conjunction with the transmedia project Condemned (my character can be found here). I’ve grown up too though. I’ve been learning with the technology as it and I both grow older as I felt the adults in my life would. But something interesting happened. Because I could help them find what they were looking for, or fix a computer’s hardware after learning to tinker with physical objects, they no longer felt the need to learn. Their growth stagnated after they realized that someone else was learning and could do it for them. I am, like many of our classmates, the family IT person, even though it was my mother that taught me pieces of code so long ago. Unhappy with the idea of letting myself be distanced from technology as many are, a product of some odd drive to keep on the high ground of technology or plainly to ensure that my family would always have someone to answer their call to help, I continue to learn more, apart from my official academic field (a wise decision on my part as the Department of Theatre Arts moves towards a technology infused Transmedia Department) in the hopes that I can use these resources available to me to accomplish what I want to create in the subjectively best way possible. As I explore these new different technologies, I ended up here, in this class for Digital Humanities because it offered another dimension to what I myself am trying to explore, as well as having the safety of a more guided and focused academic setting to explore with someone who does know what they’re doing, or at least willing to continue learning with us, the class. I’m even taking a formal programming course that draws me to one programming language to deepen my understanding of trained professionals in the field of software engineering. With all that said, I turn my focus to our reading and podcast, and to answer the last question of ‘why do the things mentioned in them matter’? For the disability question, I believe that the fact that there are people who need the assistance to do something that someone without their disability can do without that assistance means that the people who have the abilities to create the tools to make technology more inclusive should see the benefits beyond what is monetary and see that their work can increase a subset of humanities quality of living immensely. I’ve even seen the technology we currently have, screen readers and magnifiers and voice commands be a necessity for some people I’ve worked with who have poorer eyesight and it worked wonders for them. Even the document readers were very basic though, as there were some very popular file formats that I tried sending to them that the document reader couldn’t process. If we want to move towards an inclusive society where everyone has the opportunity to be happy and can do and learn as they please for the betterment of themselves and others, the opportunities need to be equally available to do so, and the creation of assistance for disabilities can help to close the gap and make society better as a whole.Where would we be in physics if Stephen Hawking no longer had the ability to share his knowledge with us? Even the notion that the keyboard and mouse is necessary to operate a computer is just what we have been trained to do, I learned a from a teacher I had when I was very young that the mouse just makes things easier, and you can fully operate a computer without one. Touchscreens offer another different way to interact with your computer, and they are many other keyboards that aren’t in the standard ‘qwerty’ layout. Women in programming is an interesting question to approach as well, because early in my life, my mother and computer teachers were all women in the field who could use the technology better than the men in my life. This too for a long time was something I had just accepted as well as a child, I just thought women were more inclined to computers. Today, I really don’t see why there is such definition between any gender. Historically, masculine and feminine qualities changed and shifted, and nothing really seemed to stick as “this makes you an xyz”. I think that really, anyone can use what they wish, and marketing’s slowly, very slowly realizing this and moving towards more inclusive campaigns where they don’t exclude potential demographics with their message. For example, I saw earlier this week two commercials: one for Nintendo and one for Star Wars, both of which felt very gender neutral, showing children and adults, women and men, all with a range of ethnicity all enjoying the product. And it truly more representative to the personal experiences I have. Star Wars and video games were never just for boys. Hopefully these changes take hold, but it takes time for these seeds that we’re planting in our young to grow. But that doesn’t mean that we have to give up on ourselves or the generations that didn’t grow up with technology. We all can still learn and strive for self improvement, and we would reap those benefits now, as we take further root in our lives we would have the tools now to accomplish things that we thought we couldn’t, break through paper barriers we once thought walls. To conclude, here is some information about some women in programming that I learned of through various research, classes, and academically interested friends. 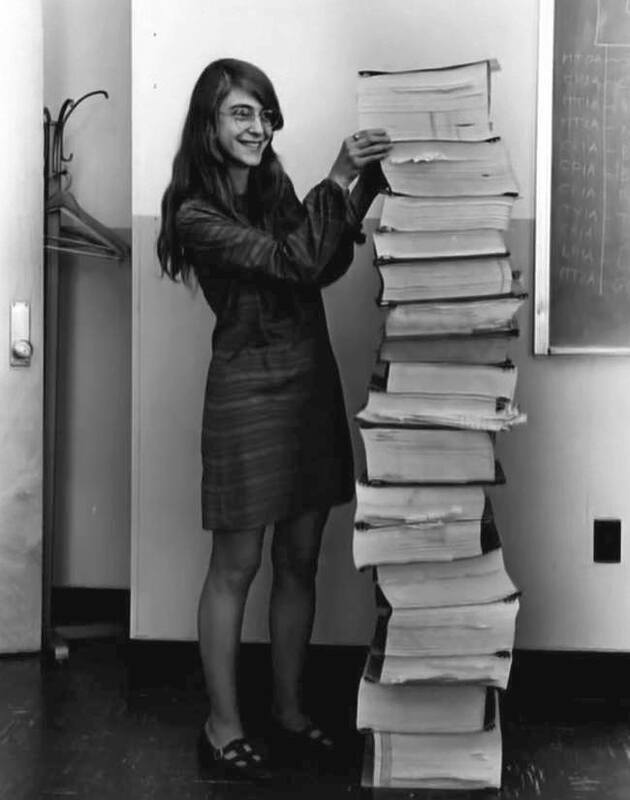 Margaret Hamilton, lead software engineer on the Apollo project that took humanity to the moon, standing next to her handwritten code. 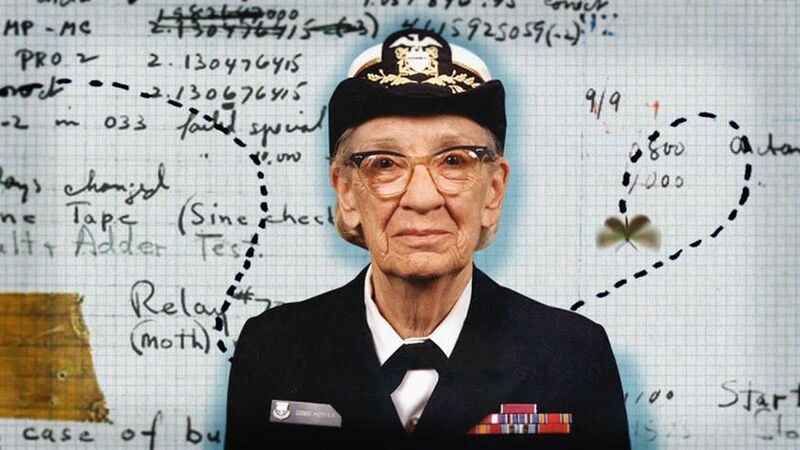 Grace Hopper, programmer who found the first computer bug (an actual bug), and innovated computer technology with the compiler and early programming languages.